When you walk into the foyer of 205 State Street, you’re faced with what appears to be a bookshelf. Other than a nob camouflaged by the literature, there’s no way to tell it’s actually a door. One might think that’s bad for business, but it’s completely by design and the business inside is extremely popular. This throwback speakeasy is brought to you by the mind of Alise Willerton, owner of 205 Dry. It’s actually the third business she dreamed up under this roof located on the Binghamton street known as Artists Row. “As soon as I walked into this building, I said I would own it someday,” Willerton says. “I feel like my soul is connected to this place.”I love the tin ceilings, the history, the nicks and scratches, the cigar stains on the floor and the old metal doors,” she says. “This building speaks to me.” And it speaks loudly. The building was the ultimate blank canvas for the fine artist who considers interior design her forte. Inspired by her travels to other major U.S. cities, she started with a “paint and sip” studio. “When I opened this place, the alcohol part of my experience and the art got blended together with the paint and sip,” Willerton says, referring to Uncorked Creations, which takes up residence on the second and third floors. The concept is pretty much exactly what it sounds like: non-artists join a professional in the studio for a step-by-step walk-through of creating a work. Wine and conversation flow throughout. It was an immediate success, with classes filling up to the point that Willerton was running out of space. She opened up another studio on an empty floor and added an equally popular wine bar. Her presence on Artists Row in Binghamton has been key. The hub of creativity in the city provides her with many top artists to work with. This readymade collection of talent has allowed her to expand offerings from traditional painting to watercolors, farmhouse wood signs and ceramics. “We’ve brought in all these different media you can now do while hanging out with your friends and drinking a glass of wine,” Willerton says. The speakeasy on the first floor was also inspired by her travels. She fell in love with the concept and became infatuated with 1920s culture and decor. Always the artist, she studied the era and started drawing. A creative contractor was able to construct the touches like the aforementioned bookshelf/door and Willerton went to work assembling the specifics of her vision. “I want people in Binghamton to feel like they’re in a different world when they’re here and I wanted every piece to fit perfectly,” she says. She spent countless hours on Antique Row, another unique Binghamton street. From the chandeliers to the furniture to the music, the place is about as authentic as it comes. The project is spurred on mainly by hometown pride and the need to be a part of its resurgence. That includes her own culinary artists, who serve up dishes made mainly from local ingredients. Her mixologists are just as adventurous as the kitchen. Suffice it to say, 205 Dry is unique. But, the story isn’t unfamiliar to Binghamton, a collection of several communities with a legacy of ingenuity. Creative entrepreneuers like Willerton are building on the bones of this once industrial powerhouse. For some it’s food, for others it’s performance, preservation or tradition. 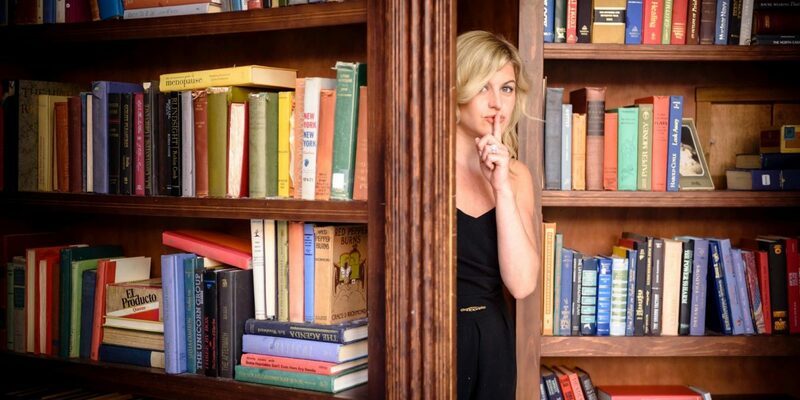 With all those stories, how fitting that Willerton hides her gem behind a bookshelf. Like the city itself, there’s more than meets the eye when you step inside.